Are you looking for a gift for a fiber friend? 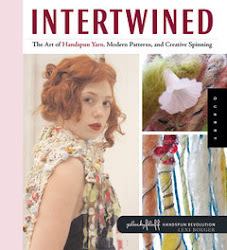 In need of a little inspiration for freeforming spin-play? These Spin Kits have been waiting in the wings for their moment, & i'm gleeful the time is now! If you came along to my Funky Fibers Art Yarn workshop at the NSW Spinning Guild, you will have already feasted on one of these little surprise packages of fiber goodness - in fact, we played with the contents all day whilst learning 4 art yarn spinning techniques! 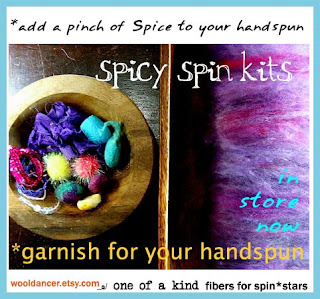 These garnishes are a fantastic quick fix when you need that something extra to add interest to your yarn.. keep them by your side at the wheel, & add a little bit of "this" to one skein, & a little bit of "that" to your next spun yarn. There is enough joy in here to spread across a few skeins really. fun fun fun i say. All the info is on the listings. i am going to be adding them daily over the next little while, so keep your eyes peeled over at etsy for them.